12Go.Asia is one of the simplest ways to find and book the many different transport options right across Asia. Take a look at where you can go, how, and for what price HERE. Lots of options here both international and domestic flights. So many combinations it’s best just to use a price comparator like Expedia, Skyscanner or Trip Advisor as the fares vary considerably. check out the range of options here. There is a huge network of Intercity buses in Vietnam but not all companies have a good reputation. Choose carefully. Often a few extra dollars can make a world of difference in comfort and safety.. Check out my recommendations and practical information here. Vietnam has a quite a good train system. If the crazy drivers have you scared, this might be a better option than taking a night bus, at least for part of your journey. Prices are not much more than the decent bus companies. There are different price points, depending on the level of comfort desired and there are even a couple of “luxury” options. When I looked at resources for this section I really couldn’t go past this website for all things on trains in Vietnam. (and any other country in the world for that matter!). The Man in Seat 61 really knows his stuff. Follow this link for maps, schedules, prices, pictures and anything else you could possibly want to know about catching a train, including International Options. NOTE that Vietnam Rail now has an online booking system. It’s in Vietnamese but if your right click you should get a “translate” option which is pretty good and navigation is easy. It clearly shows what tickets are available and seems to accept all major credit cards for payment. If you are headed anywhere during the TET period, you should book as far ahead as possible. Boats may have improved since they resumed, but in 2012 it wasn’t what I’d call a pleasant journey. The view was nothing special, the boat was crowded, and it was a very noisy. There are also far less options for going and returning than by bus which runs every 15 minutes. I believe another operator will begin service early in 2015 which might improve things. Tickets may be bought at a ticket booth at 10B Ton Duc Thang, where the boat leaves from. It is recommended to book your return ticket before you leave as there are some shonky scams with scalpers wanting twice the price for tickets if you try and buy them in Vung Tau. Friends of mine recently took a trip with Heritage Cruises and absolutely loved it. It’s obviously out of the range of the typical backpacker but for luxury lovers it would be an awesome way to see the area. The boat arrives and leaves from My Tho in the Delta, but transfers to Ho Chi Minh City are included as part of the package. Cruises range from two to seven nights. Activities are arranged both on and off board and include expert lectures, cooking classes, cultural performances and interaction with local charities. Several other companies ply the waterways of the Mekong between Vietnam and Cambodia. Vessels range from small private sanpans, right through to four story giants that sleep over 150 people. Cruises range from 1 night through to 16 days (including Halong Bay and Cambodia). Companies such as Luxury Cruise Mekong (a member of the Indochina Voyages – Indochina Travel) are representatives for all the major cruise companies and can suggest itineraries and boats based on your budget and personal preferences. Vietnam is a popular stop with many cruise lines plying the South East and Northern Asian routes. The big drawback with arriving in Ho Chi Minh City on a large Cruise Boat is that the port, Phu My, is around 80 km from the centre of town and there is very little around it. Certain companies have the monopoly on tours and transfers so you will pay a LOT more than an independent tourist arriving by other means. I’m pretty sure you can walk outside the port and try your luck at the taxis that wait there. BUT be aware that TAXI SCAMS are alive and well in Vietnam. You may just pay as much, if not more, than the arrangements you can make on the ship itself. And then, of course, you have to get back again. If your cruise boat is smaller it will dock on the Saigon River , in District 4 which is much closer to the sights. Small tour companies like Saigon Unseen can be booked directly online and will pick-up and drop off at the ship. If you want to get off the boat you may need a Visa, depending on your nationality. This can usually be arranged by your cruise company. Make sure you check in case you have to get it beforehand. Once you are here you can travel in luxury or take much cheaper options. Ho chi Minh’s traffic jams can be a real problem but the locals have getting from A to B worked out as efficiently as possible. As long as you can cope with the frenetic pace of the city you’ll be fine. Travel in an air conditioned taxi, experience the thrill of negotiating the city on the back of a fast moving scooter or try out the public buses. As long as you are patient, you’ll get where you are going eventually, hopefully in one piece. 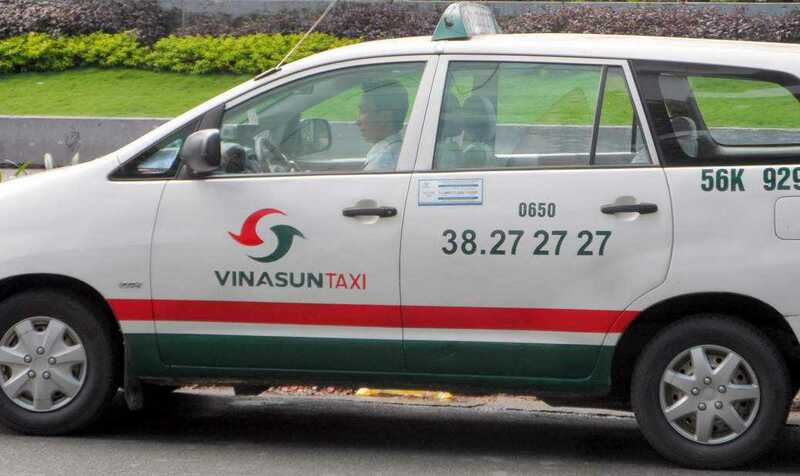 Vinasun taxi with logo, phone number and Rates (above the ph Nr) clearly displayed. Catching a taxi in Saigon is a relatively cheap, very comfortable way of getting around town. A trip around District 1 is unlikely to cost you more than $3 or $4. Coming all the way from the airport to Disctirct will be around $8. Unfortunately though, there are a few rogue operators about who will do their very best to rip you off. Don’t be put off however. 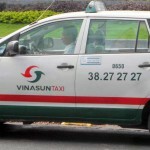 Read my tips for avoiding taxi scams and taking a Saigon Taxi will be one of the safest ways of travelling around the city as well. Click here to read how to remain scam free on your next visit when catching a cab. 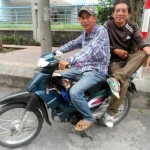 I’ve recently been made aware of a new Ho Chi Minh City Airport Pick-up service. It’s relatively cheap, reliable, and comfortable and is run by a couple of guys hooked up with Airbnb and Triip.me. Details here. 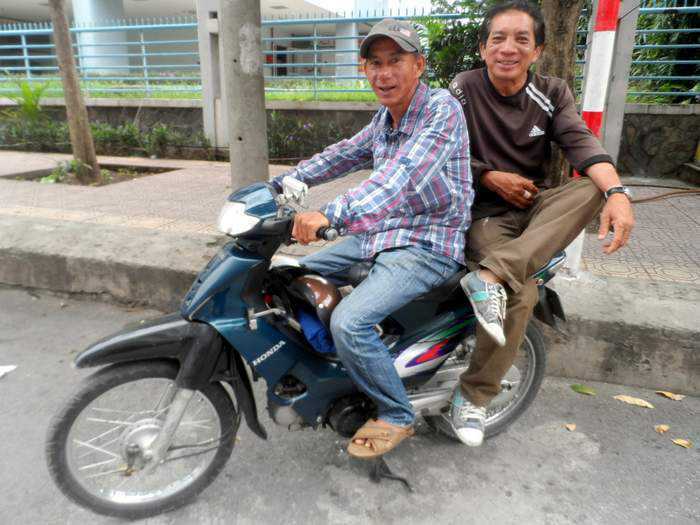 Uber is making a big splash in Ho Chi Minh City. I only used them once very early on and I wasn’t all that impressed. I had a long wait and they weren’t aware of major construction in the city that complicated our journey. In contrast, all the Vinasun drivers (I have a rank right outside my apartment block) are knowledgeable of such things. Uber is cheaper than taking a taxi and I’m sure have improved their service with more drivers on the roads who will have gained experience. Definitely the most thrilling way to get around town, but taking a Xe Om (Motorbike Taxi) is probably the quickest way of getting from A to B. It’s also cheap, convenient and will defnitely be something you’ll talk about when you get home. Have a look at my Tips for Taking a Xe Om when visiting Saigon. Public buses in Ho Chi Minh city are dirt cheap, frequent and go to almost every part of the city. There’s even a bus to Ho Chi Minh Airport for less than 15 cents. I’ve details the pros, cons and some tips for catching buses around town here and detailed some practical information about key routes and getting to interesting sites around the city here. Much of Ho Chi Minh City is best seen on foot. Not only are the sites and attractions quite close but you can soak up the atmosphere so much better than behind the windows of a coach or car. If you smile and nod, most people will return the courtesy and you can really experience the Vietnamese way of life up close and personal. which companies to go with if you don’t wish to go it alone. Walking Ho Chi Minh City – The do’s and don’ts for walking around Saigon. Walking around Ho Chi Minh City – Day 2 – . This itinerary takes you a little further afield and picks up temples, museums, gardens and markets as well as one of the best views in the city.